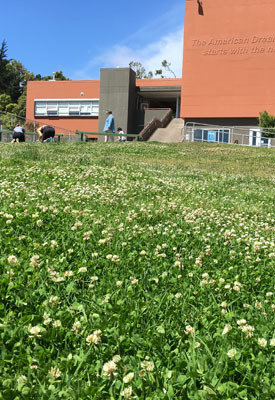 Those beautiful little white daisies (see picture at top) that seem to be all over the park lawns are Bellis perennis, commonly called the English Daisy. It is a perennial plant and flowers for much of the year. Though invasive, the species is still considered a valuable ground cover in certain garden settings, e.g., as part of English or cottage inspired gardens, as well as spring meadows where low growth and some color is desired in parallel with minimal care and maintenance while helping to crowd out noxious weeds. It is usually considered a weed of lawns but in an informal setting it can create a pretty addition to short grass areas. Bellis perennis has astringent properties and has been used in herbal medicine. In ancient Rome, the surgeons who accompanied Roman legions into battle would order their slaves to pick sacks full of daisies in order to extract their juice, hence the origin of this plant’s scientific name in Latin. Bandages were soaked in this juice and would then be used to bind sword and spear cuts. 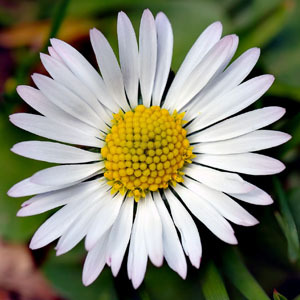 Bellis perennis is still used in homeopathy for wounds and after certain surgical procedures. Daisies have traditionally been used for making daisy chains in children’s games. 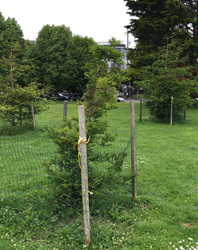 The newest trees in Duboce Park have taken root and are beginning to grow and will soon provide much-need shade in the park as well adding additional visual interest. 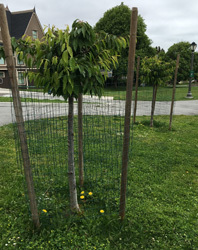 The four tulip poplar trees (Liriodendron tulipifera) were planted along Duboce Avenue about five years ago and are considered both a shade tree and an ornamental tree. They grow quickly and can reach a height of 70-90 feet and a spread of around 40 feet at maturity. They are the state tree of Kentucky, Indiana, and Tennessee. An example of a mature tulip tree can be found in the park next to the blue house at the end of Pierce Street. The three cypress trees with the protective fence around them in the southeast corner of the park will eventually form a small grove of huge trees that may grow to 50 to 80 feet tall with a spread of 20 to 30 feet. 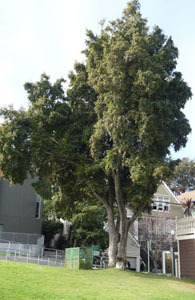 The fast-growing trees were planted about five years ago near the huge cypress at Steiner and Duboce. The two flowering cherry trees that were planted next to the basketball court three years ago are doing well and we can expect to see vibrant pink blooms on them each spring. They replaced two dying trees that were removed during Youth Play Area construction. 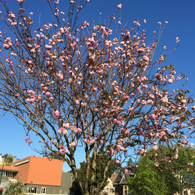 Lots of pink, red, and burgundy flowers are blooming in Duboce Park – it must be spring! Here’s a brief description of three of them. Prunus is a genus of trees and shrubs, which includes the plums, cherries, peaches, nectarines, apricots and almonds and two examples are shown above in the left and middle pictures above. 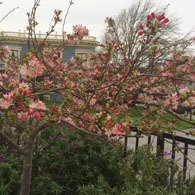 There is an Ornamental Plum in the Pierce Street planting circle and two cherry trees at the top of the hill next to the MUNI stop at Duboce and Noe streets. There are around 430 species are spread throughout the northern temperate regions of the globe. Many members of the genus are widely cultivated for fruit and ornament. The fruit from this genus are commonly called the stone fruit. Leptospermum, commonly called Australian Tea Tree, shown at the far right, is located in the triangle between the basketball court and the playground, and is a species of flowering plant in the myrtle family Myrtaceae, native to New Zealand and southeast Australia. About 83 species occur in Australia, all but two endemic. It is a prolific scrub-type tree and is often one of the first species to regenerate on cleared land. There are currently 86 recognized species. 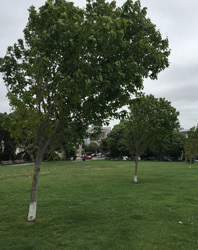 Last month we showed four of the trees in Duboce Park. This month we are featuring three colorful plants that are located in the Playground. 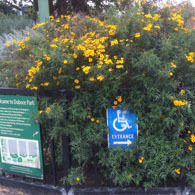 Tagetes, or “Mexican Daisy,” see picture above left. A common name in English, “marigold”, is derived from “Mary’s gold”, a name first applied to a similar plant native to Europe, Calendula officinalis. Tagetes species vary in size from 0.1 to 2.2 meters tall with floral heads typically 1 to 4–6 cm in diameter. Blooms naturally occur in golden, orange, yellow, and white colors, often with maroon highlights. Malus, or “crabapple,” see picture above middle. Crabapple fruit is not an important crop in most areas, being extremely sour and (in some species) woody, and is rarely eaten raw. In some southeast Asian cultures they are valued as a sour condiment, sometimes eaten with salt and chilli pepper, or shrimp paste. Apple wood gives off a pleasant scent when burned, and smoke from an apple wood fire gives an excellent flavor to smoked foods. The flowers are borne in corymbs, and have five petals, which may be white, pink or red. Flowering occurs in the spring. 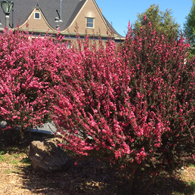 Crabapple trees are fairly drought tolerant. Echium fastuosum, or “Pride of Madeira,”see picture above far right, grows along the coast of California. Huge, dramatic, blue-purple spikes appear on the end of upward curving branches in the spring. It does well in poor, dry soil but does need drainage. The typical size is 3’-6’ tall and wide. 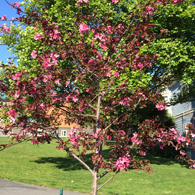 The Ornamental Plum trees (shown at top) along the Scott Street side of the park are now in full bloom with pink and pink-white flowers along Scott Street and many other streets near the park. The flowers disappear rather quickly and will be replaced with purple fruits about one inch wide. The trees will sprout ruby leaves that darken to reddish-purple. They can live for over 50 years. Eugenia is a genus of flowering plants in the myrtle family Myrtaceae and all species of Eugenia trees are woody evergreen trees and shrubs. Several are grown as ornamental plants for their attractive glossy foliage and a few produce red berries. 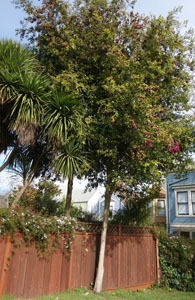 The Eugenia tree located next to the brown house on Carmelita Street (shown at right above) is considered a specimen tree because of its unusually large size and can live about 50 years. The tree was once popular but it is not as common now. There is a majestic Cypress tree in the planting circle next to Potomac Street. Cypress trees produce some of the world’s most prized wood. It is lightweight and durable which makes it an ideal building material. Adding to the wood’s popularity is the fact that it doesn’t generate sap and therefore doesn’t bleed. 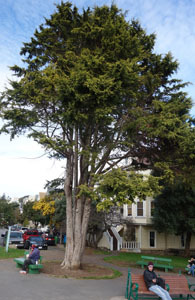 The Monterey Cypress can grow up to 70 feet tall and can yield cones. The Lilly Pilli tree on the east side of the Carmelita Street entrance anchors the northwest corner of the park. It produces purple fruit and can live over 50 years.